The Aerospace Maintenance Competition Presented by Snap-on is the foremost international competitive skills event for aviation technicians. It provides certified AMTs from major airlines, MROs and OEMs, as well as military personnel and students in FAA Part 147 schools, the chance to test their skills against their peers. The three-day competition runs from 9 a.m. to 5 p.m., Tuesday, April 9; 8 a.m. to 5:30 p.m., Wednesday, April 10; and 8 to 11 a.m., Thursday, April 11, with the awards presentation following from 1 to 4 p.m. The biggest field to date will be competing in 31 events — including safety wiring, composite repair, electrical troubleshooting, turbine engine and others — that challenge their knowledge, skill and teamwork. The team earning the overall best score takes home the grand prize in aviation maintenance, the William F. “Bill” O’Brien Award for Excellence in Aircraft Maintenance. Presented by Snap-on, the coveted award signifies the highest standard of excellence in aviation maintenance. The O’Brien Award is a traveling trophy that debuted at the 2013 competition. The winning team receives the honor of displaying the 5-foot-tall trophy in their facility for a year. In addition to the trophy, Snap-on is awarding more than $75,000 in tools and equipment as prizes to the top finishers in the competition. Last year, the five-member team from United Airlines Team Cleveland repeated as champions, keeping the O’Brien Award trophy on display at the company’s facility at Cleveland Hopkins International Airport for a second straight year. “The AMC is a fully scaled and highly competitive event. When you take home the William O’Brien Trophy, you’re the best-of-the-best in the MRO profession,” says Tom Murray, director of Marketing, Snap-on Industrial. Snap-on supports aviation technicians around the world through its commitment as the official tool sponsor for the Aerospace Maintenance Competition. Snap-on provides all the tools and equipment used by the participants during the competition, as well as planning and logistical support. Aviation maintenance supporters can get involved with the AMC through college financial donations. The Aerospace Maintenance Council, which hosts the AMC, is accepting donations from industry organizations to increase funding of its Phoebe Omlie Award. Named after the first female to receive an FAA aircraft mechanic’s license in 1927, the Phoebe Omlie Award is available to both men and women who are enrolled in an FAA Part 147 school and who are participating in the AMC. Although the scholarship began just two years ago, seven students have received financial assistance. This year the council is hoping to raise $20,000. To make a financial donation to the Phoebe Omlie Award, email Crystal Maguire at team@aerospacecompetition.com. For students interested in applying for the scholarship, visit https://www.aerospacecompetition.com/scholarship.html. For more information about Snap-on, call 877.740.1900, or visit www.snaponaviation.com. 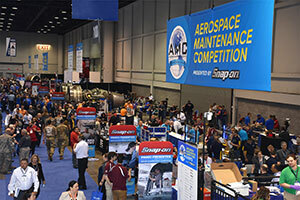 For information on the Maintenance Skills Competition Presented by Snap-on, visit www.aerospacecompetition.com.